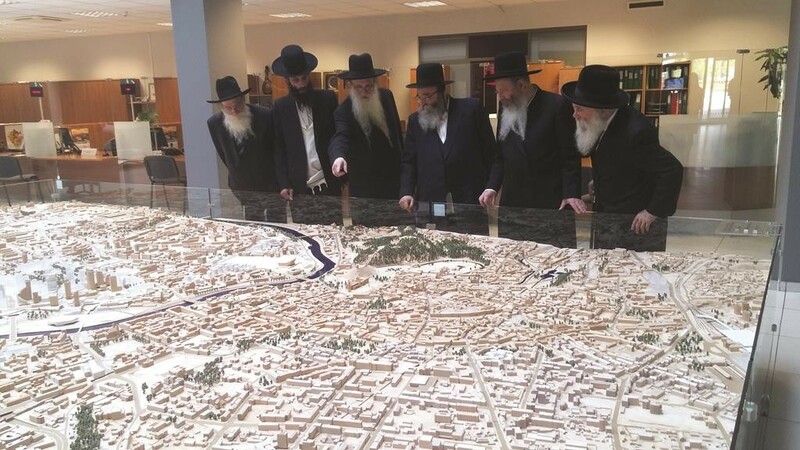 (R-L) Harav Schlesinger of Geneva, Harav Kotler, Rabbi Niederman, Harav Kalmanowitz, Rabbi Yecheskel Kalmanowitz and Dr. Schaps, viewing a miniature of the plan for the Sports Palace and the surrounding area in City Hall. During the meeting with the Mayor. A delegation of leading Roshei Yeshivah, Rabbanim and askanim met with Lithuanian officials to plead for a cancellation of plans for construction on one of Jewry’s most sacred burial grounds, the Snipisek Jewish Cemetery in Vilnius. Harav Aryeh Malkiel Kotler, Rosh Yeshivah of Beth Medrash Govoha, and Harav Osher Kalmanovitz, Rosh Yeshivah of the Mirrer Yeshivah-Brooklyn, traveled to Vilna to express their deep concern over the matter. Representatives of the Lithuanian government attending the meeting included First Deputy Chancellor Mr. Rimantas Vaitkus, who welcomed the group on behalf of Prime Minister Algirdas Butkevičius, who was out of the country; and Remigijus Šimašius, mayor of Vilnius. The meetings were attended by a number of top governmental advisers and the chair of the local Jewish community, Faina Kukliansky. Both Roshei Yeshivah, who traveled only for the day, expressed the deep spiritual and historic connection of the Jewish people to Vilna and Snipisek. The trip entailed an additional effort on the part of Harav Kotler who needed to arrange for minyanim along the way, as he is in aveilus for his recently departed mother, a”h. This article appeared in print on page 1 of the August 27th, 2015 edition of Hamodia.